27 Sep	This entry was published on September 27, 2017 at 6:53 pm. 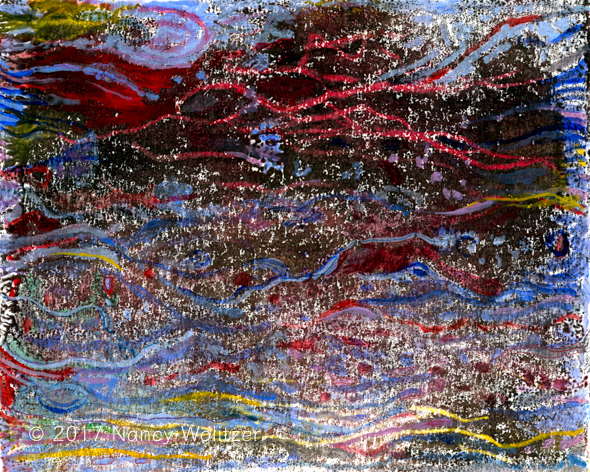 It’s filed under Artwork, Painting, Printmaking and tagged Acrylic, Akua ink, Mononprint, Nancy Wolitzer, Ocean, Painting, Printmaking, Remembrance, Waterscape. Bookmark the permalink. Follow any comments here with the RSS feed for this post. This is amazing, Nancy! The glorious pearl-like texture, the shimmer and yet the gravity in the title. I love it. Thanks so much! I really appreciate all of your comments. I see the pearl-like texture, which I had not even been aware of myself.